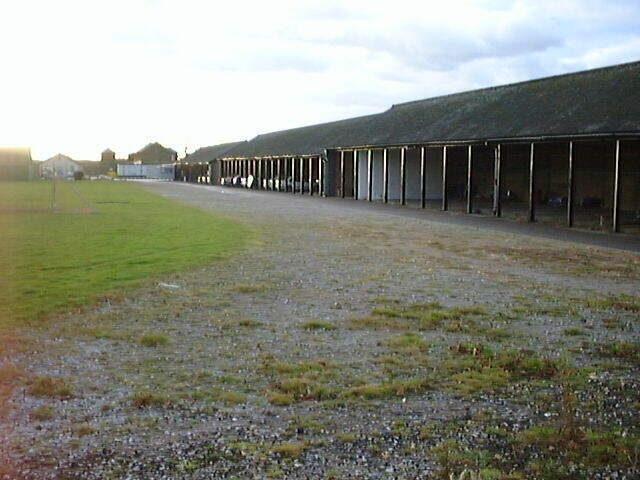 This cinder track was within the former Caterham barracks which Linden started developing in 1998 as an up-market housing and conference centre called The Village. It is not known when the track was built but the site was used for military purposes from 1875 to 1995. The track existed in full until 1999 but the first bend was sectioned off and removed by Jan 2000 although the course of it is still retained as a path. By May 2001 the whole track and the infield had been dug up in preparation for houses to be built over it and by late 2001 the first houses were being completed. The course of the track, apart from the first bend as mentioned above, has been retained as the access road and is called Alexander Crescent. The track had however been unusable for some time and the surface of what remained of it until 2000 was stony and overgrown and concrete bollards had been erected across the track in two places to stop cars driving around. The infield was however a well-maintained grass pitch which was used for football. The DT/HT cage was also still intact and a SP circle was also still there but no runways were detectable. The location of what was the steeplechase water jump pit on the inside of the top bend had been filled in and was rather overgrown.